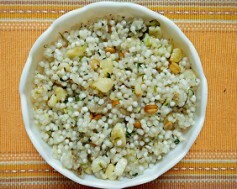 Sabudana Khichdi also called as tapioca pearls or Sago is usually made during fasting days like Navratri, Mahashivratri and many other Hindu festivals. It is the most popular recipe for vrat or Hindu fast. Sabudana has many health benefits as it contains large amounts of protein that can help muscle growth and strengthening. It is also rich in calcium, iron and vitamin K which helps improve bone health and get rid of fatigue. Sabudana khichdi is a quick recipe which is also ideal for breakfast. It is a great meal for kids due to the texture and nutritional value. Cooking time : 8-10 mins. Soak Sabudana in 2 cups of water for about 2 hours. Boil the potatoes and peel once cooled down. Cut the potatoes in small pieces. Roast the groundnuts till they change color. Remove their skin once cooled down. Now take a heavy bottomed pan/kadhai and heat oil. Once oil is hot, add cumin seeds. When cumin seeds begin to splutter, add green chillies slit into halves length wise. Add potatoes and cook on high flame till they turn slightly brown. Then reduce flame and add soaked sabudana. Add salt and stir gently. Cook for 3-4 mins. While cooking, sprinkle very little water on sabudana to prevent it from sticking to the kadhai. Now add pepper powder and groundnuts, and toss well. Sabudana khichdi is ready. Serve hot.